← Humber. Southeasterly Four. Moderate or Good. Rain later. THERE was a loose plan fluttering about this morning like a threadbare flag above a roadside burger bar. But the wind changed and the plan got blown across fields and was last seen snagged on a fence alongside a ragged length of black plastic silage bag and other rural detritus. It wasn’t much of a plan anyway . . . 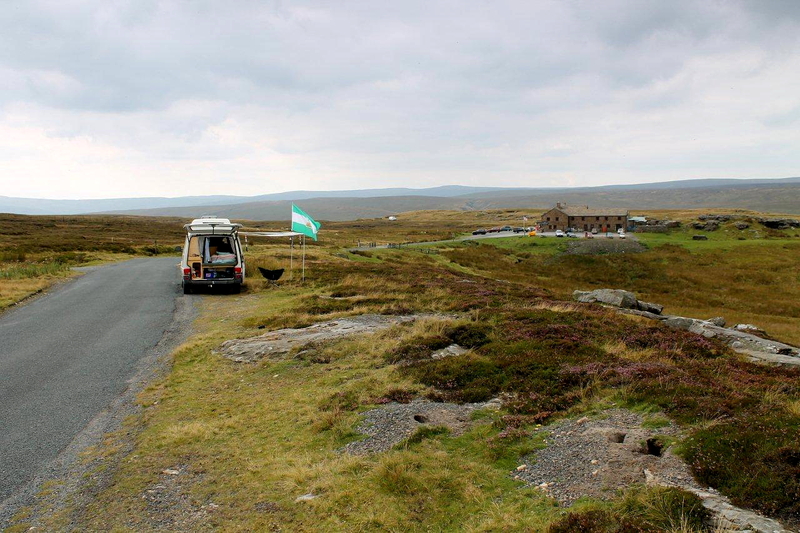 The plan was quite simple: drive to Britain’s highest pub, the Tan Hill Inn; leave my wife in the van with a good book and a hot kettle; wander off across miles of Pennine moorland with the sun on my back; then dine and drink in the Tan Hill before repairing to the van for a night beneath the stars. 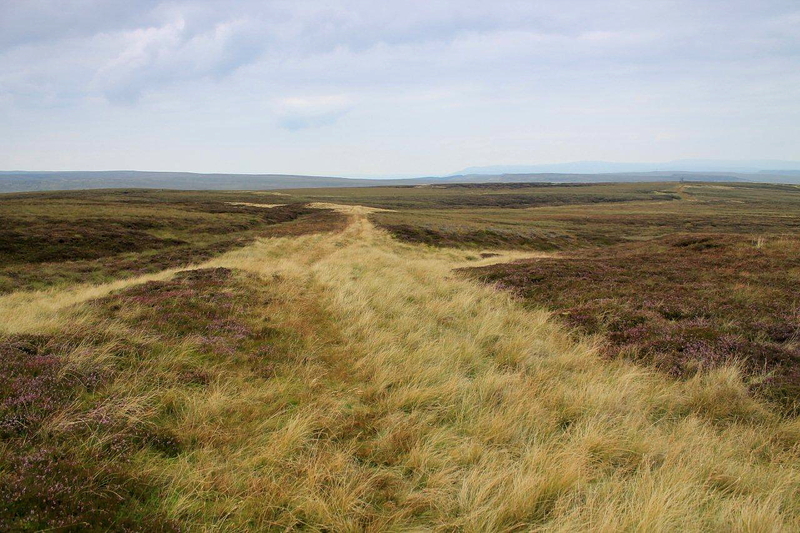 All has gone well up to the wandering across the miles of moorland bit. 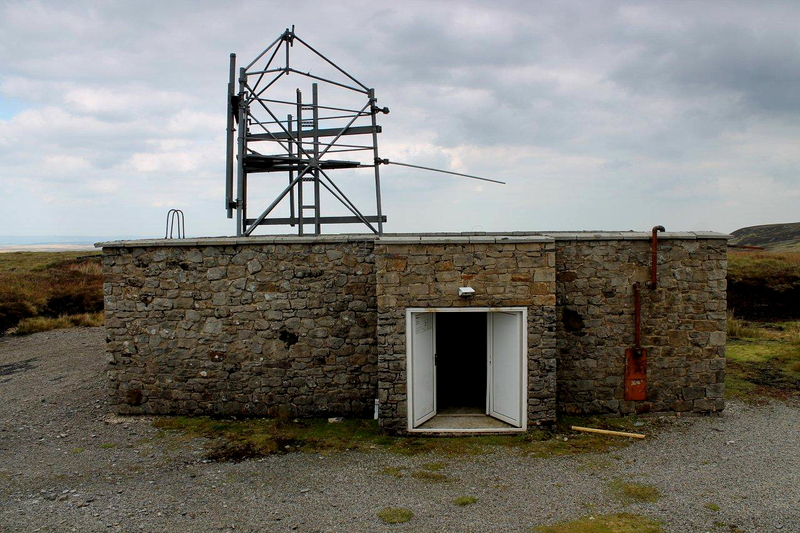 Within two-hundred metres of leaving the van I’ve stumbled across an abandoned transmitter station and taken lots of pictures – thinking I’m recording the industrial archaeology of the future. And who’s to say I’m not? 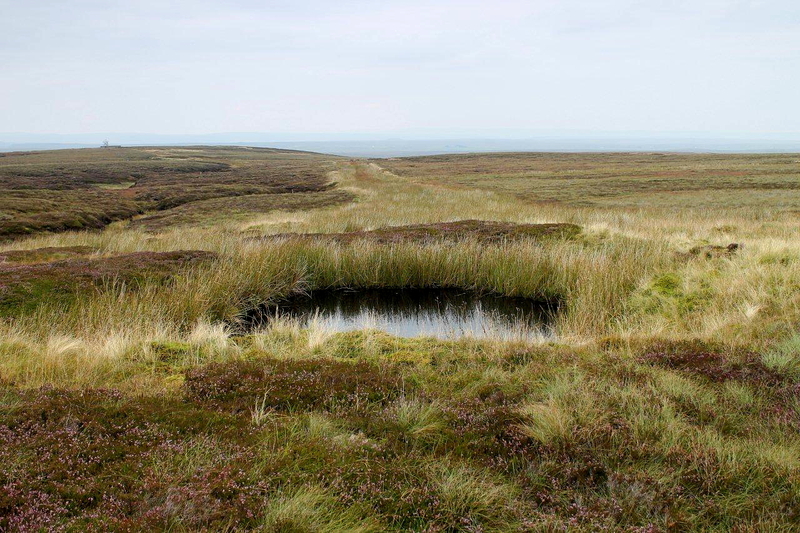 Within the following two-hundred metres I’ve wandered into the fascinating though little-known remains of Tan Hill’s ancient coalmining industry. This is where the plan blows off across the heather. It was a rubbishy plan anyway. All I did was glance at a map and decide to head towards various dips and rises in the landscape, doing a circuit via Great Punchard Head, Water Crag, the interestingly named Wham Bottom (must be a George Michael joke in there somewhere), Rogan’s Seat and Long Rigg. But the plan has altered. Let me tell you about the Tan Hill Inn instead. You probably know this stuff already, but what the hell. 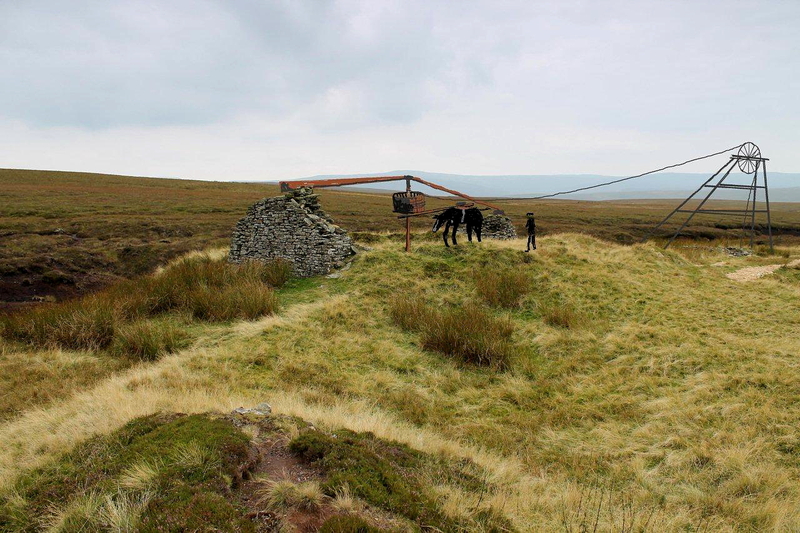 The Tan Hill stands at an elevation of 1,732ft (528m), making it Britain’s highest pub. It dates from the 17th Century and was built as a barracks, or hostel, for colliery workers. Although its official address is North Yorkshire, three counties converge just outside the back door – North Yorkshire, Cumbria and Durham. With the local government boundary reorganisations of 1974, the pub found itself in County Durham, but after noisy protests the authorities moved it back into North Yorkshire. Sounds like a load of fuss over nothing, but there you go. Yorkshire folk always know best, apparently. 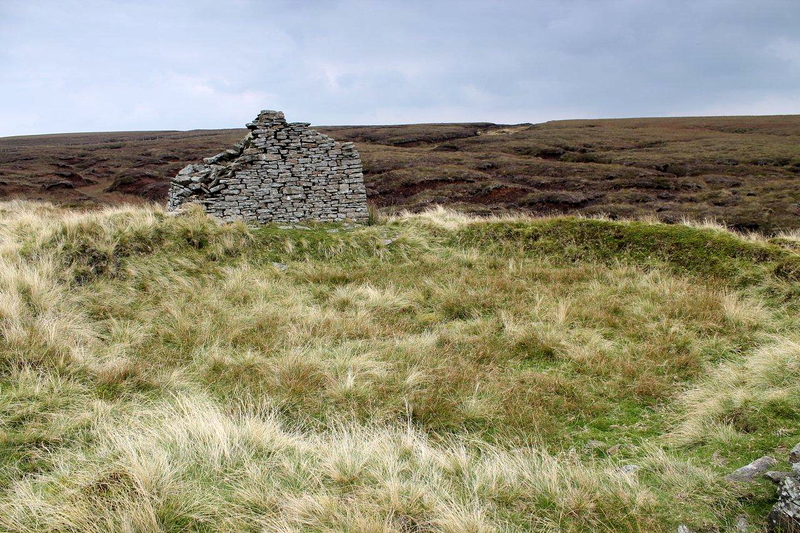 So long as there’s rain in the clouds and wind on the moors, the Tan Hill will be associated with radio and television personality Ted Moult, who, in an iconic 1980s TV advert, famously scattered feathers inside the pub windows during a howling gale to prove the effectiveness of Everest double glazing. Besides being credited with inventing the pick-your-own-strawberries concept at his Derbyshire farm, it was his finest hour. Moult committed suicide in 1986. 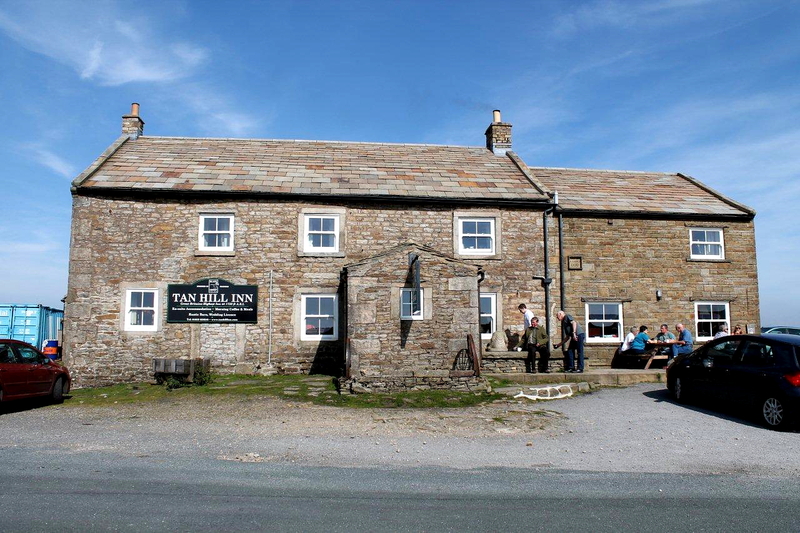 It is said that on stormy nights, when the wind rattles the slates of the Tan Hill Inn, a ghostly feather can be seen drifting past the windows. It’s true. So I’ve suddenly found myself among the remains of Tan Hill’s impoverished coalmining industry. I say “impoverished” because these pits were nothing more than shallow scratches a few fathoms deep, troubled with bog-water and with little more than horse power to pump the workings and raise the coal. 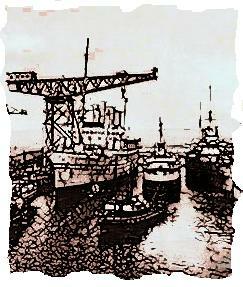 During their productive peak, which appears to have occurred during the early years of the 19th Century, the miners would have been using methods and equipment that had changed little since the days when the pits opened in mediaeval times – while forty miles to the north-east, in the Durham coalfield, engineering pioneers were laying the first railways, designing and refining colossal pumping and winding engines, and constructing the first steam locomotives. All notions of retrieving my walking plan are blown away when I stumble upon the remains of a horse gin. I’ve mention these contraptions before, but just to refresh your memories I’ll go through it again because this is one of the best examples I’ve seen. A horse gin (gin being a corruption of “engine”) was a capstan around which a horse was led in a continuous circle. The capstan wound a rope and the rope hauled a kibble (large bucket with a rounded bottom to prevent it snagging) from the nearby shaft. In this way minerals, spoil and water were removed from the pit. 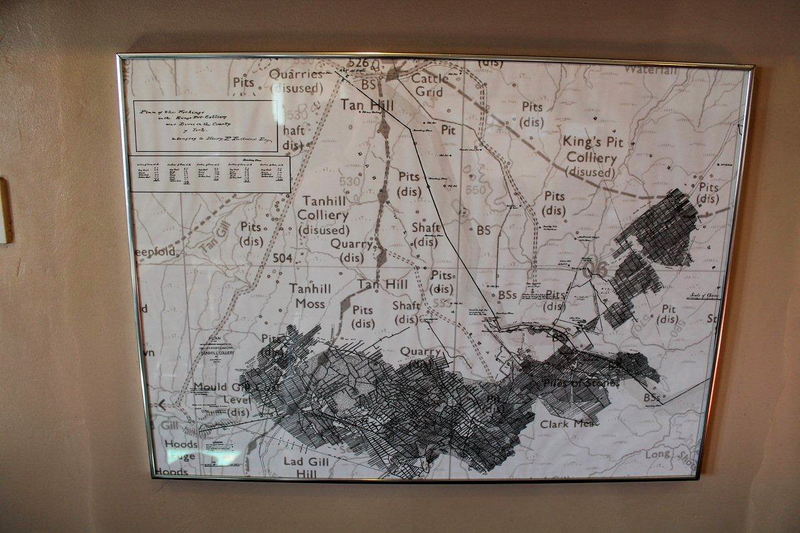 Look at a large-scale map of any mining area in the country and you will probably see evidence of their existence in old names: Gowerdale Windypits, on the North York Moors, is one – “windypit” being a corruption of winding pit, as in horse-winding pit. 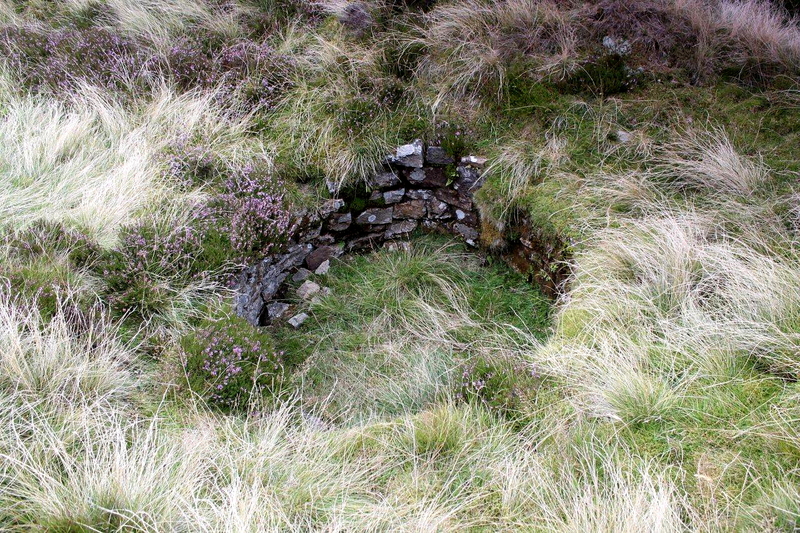 Gin pits, horse-winding pits, windy pits, whim pits, horse whims, whim shafts – they were everywhere. 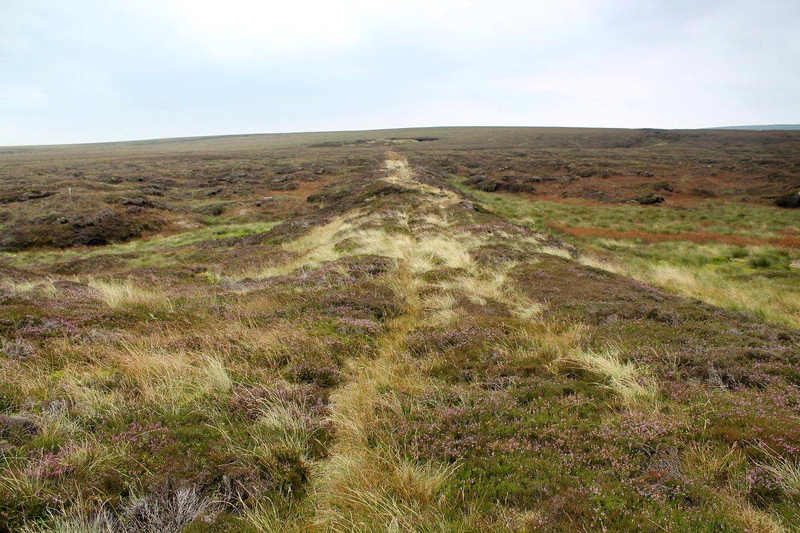 And here’s one in the heather a few hundred metres from the bar of the Tan Hill Inn. I’m on a roll. This walk has turned out to be far more interesting than anticipated. I use the word “walk” with a degree of licence. 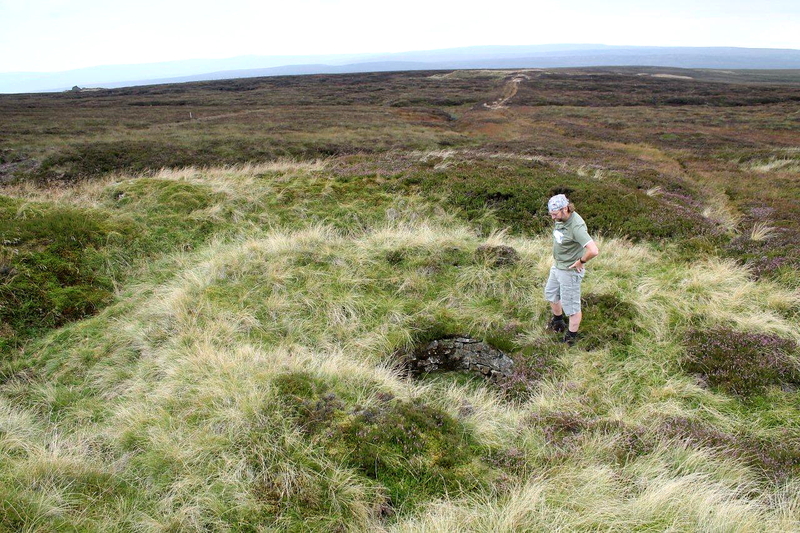 It’s more a hectic stumble from one heathery mound to the next. 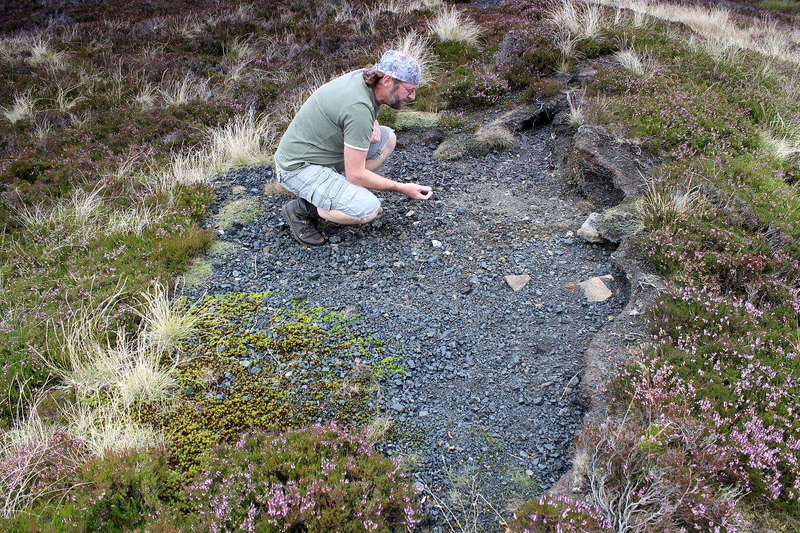 And on all of these mounds I find scatterings of coal among the heather – coal that has lain here among the spoil and roots since the last miners led the last horses away from these workings many, many decades ago. An idea springs to mind. What if I gather a bag of coal to make a fire? Will it burn? 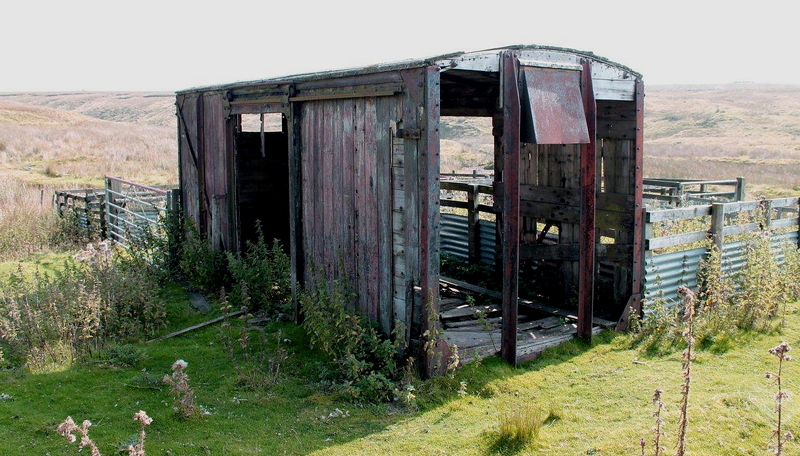 Coal is coal, but this has been weathering in a harsh environment since the mid-19th Century, possibly earlier. What the hell. 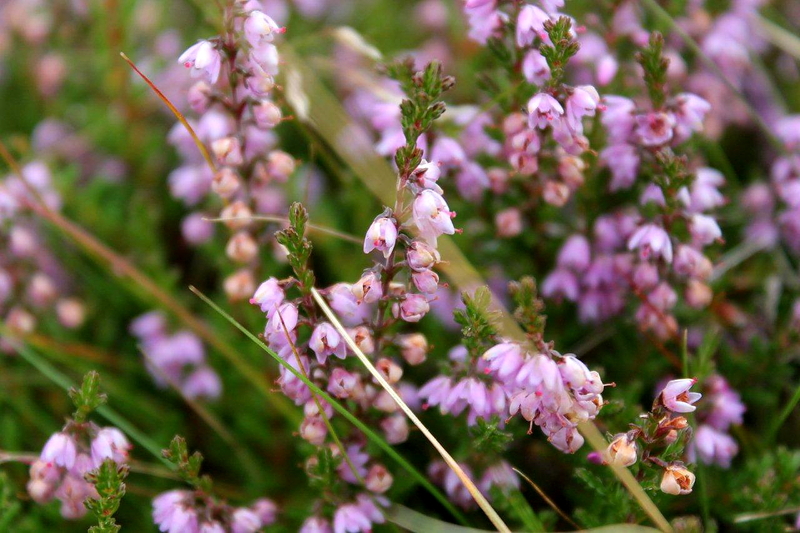 I pick among the heather and soon have a Sainsbury’s bag full of the stuff. Back at the van I show Anne my haul. She says: “That’s nice.” But I can tell she’s not over impressed. It’s my male intuition. Women don’t seem to share the same enthusiasm for the important things in life. It’s like when you try to explain the subtle differences between early, second-early and early-maincrop potatoes. They listen politely but you suspect they have no intention of retaining the knowledge. I proudly stash the bag in the back of the van. My hunter-gatherer instincts have been awakened. I am man, the provider of warmth and light. With this bag I intend to create fire. 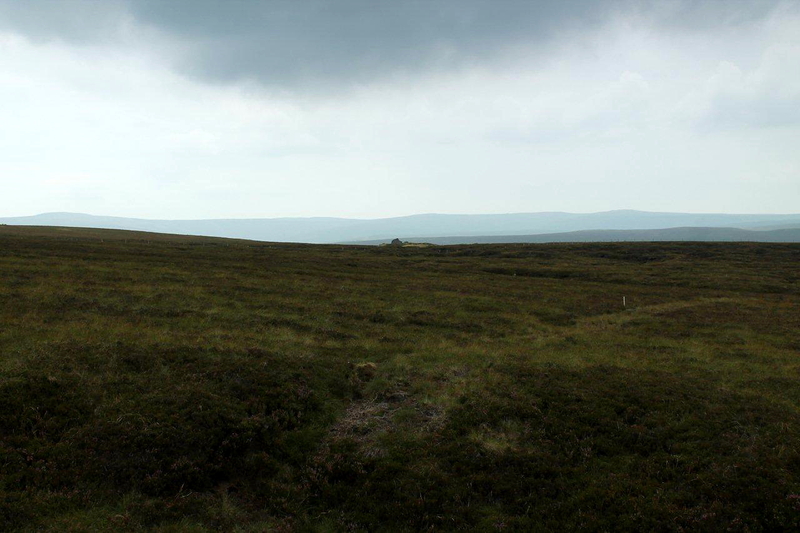 But first, let’s see if the final stage of the plan can be retrieved – the stage concerning eating and drinking in the Tan Hill Inn. 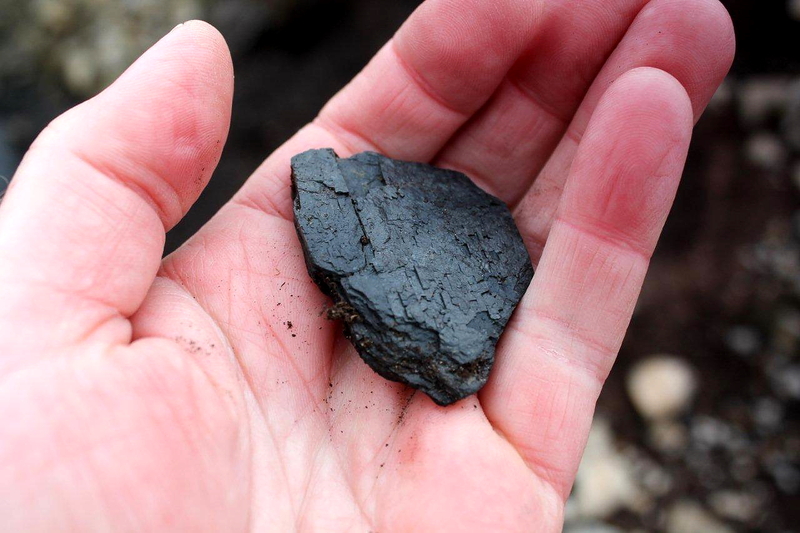 IT’S COAL, but will it burn? The answer is . . . THIS is the latest in my collection of old railway goods wagons reclining and declining in obscure locations. 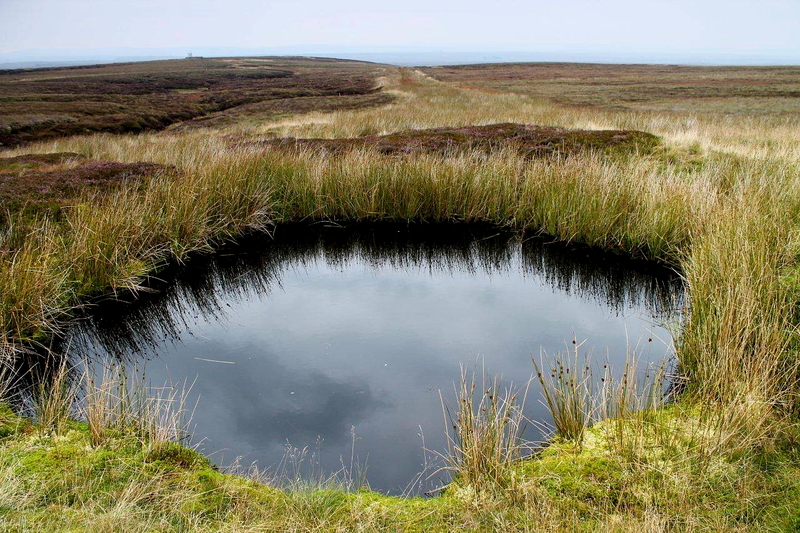 This one sits in Ease Gill, just below the back door of the Tan Hill Inn, at an altitude of 1,466ft (447m) and several tortuous miles from the nearest railway line – which closed many years ago. Hmmm. Just thought I’d mention it. Tyrosemiophiles collect cheese labels, for heaven’s sake. 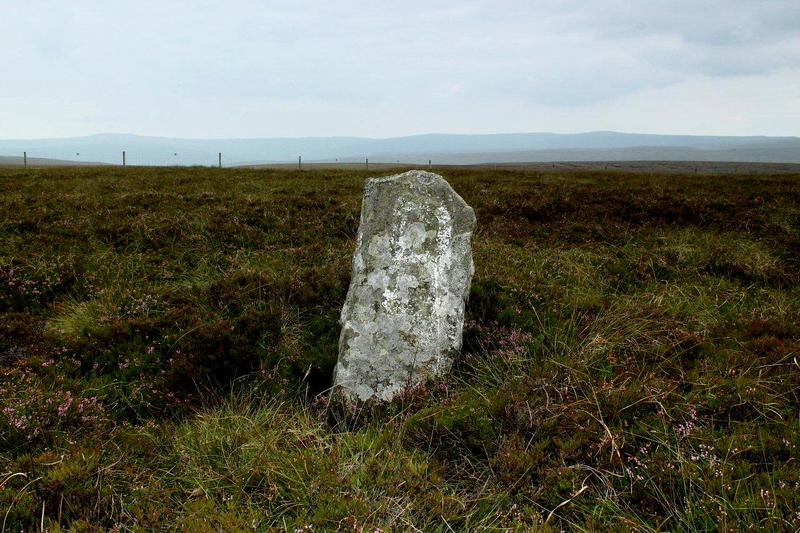 This entry was posted in Beer, Environment, Footpaths, Geology, Ghosts, Hiking, History, horse gins, Industrial archaeology, Mountains, Railway goods wagons, Tan Hill Inn, Teesdale, Walking and tagged Cumbria, Mining History, outdoors, Pennines, transportation, WPLongform. Bookmark the permalink. Another great article. I loved your comment: “Can’t say I noticed them myself, but the grouse were really impressed and cheered on Team GB gold medal winner Peter Wilson in the shooting events”. Hi Al. Glad you enjoyed it. Fascinating area that. It’s been on my doorstep for donkey’s years and I’ve never had a root around there. It’s a damned good pint in the Tan Hill as well! I always learn a lot from your posts, Alen! We’ve been past that pub lots of times but I didn’t know it was on the edge of three counties (although I knew it was reputed to be haunted). There are lots of ‘Tan’ hills and I believe the ‘tan’ comes from the same Welsh word meaning ‘fire’. Which is quite appropriate, really! I’m slightly concerned, having read your blog for a while now, at how many potentially lethal holes you come across whenever you step outside. That old railway truck must be one of your best! Very photogenic. Hiya Jo. You always raise some interesting points. 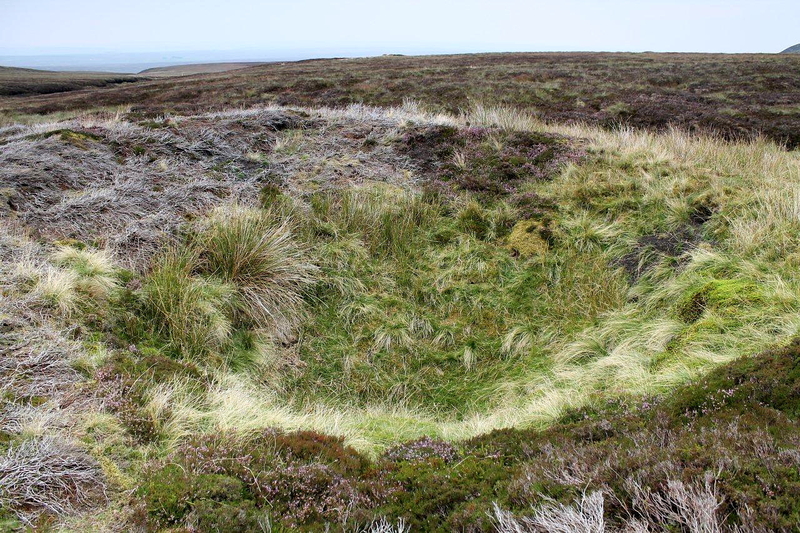 It didn’t occur to me to look into the origins of the name Tan Hill, and now I don’t have to because you’ve done it for me. Old names are fascinating things. 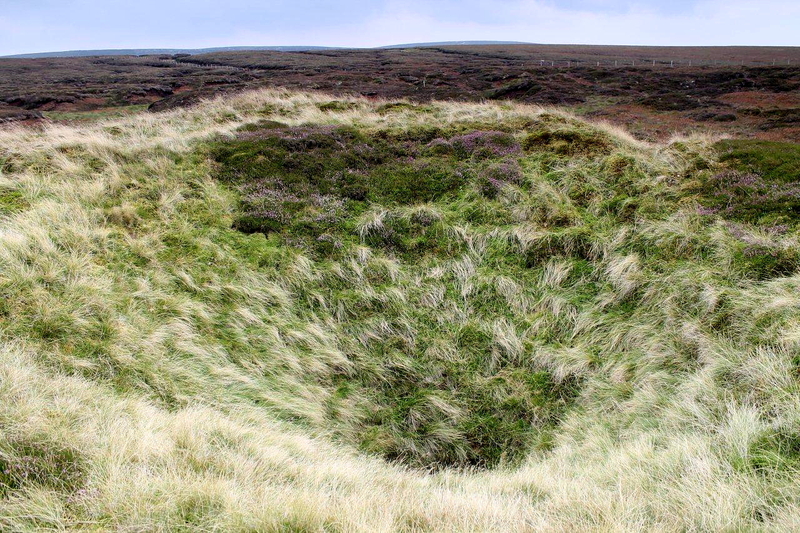 Lethal holes are everywhere in the Pennines, and to a lesser extent in the Lake District. Wales has its fair share and Cornwall is riddled with them. 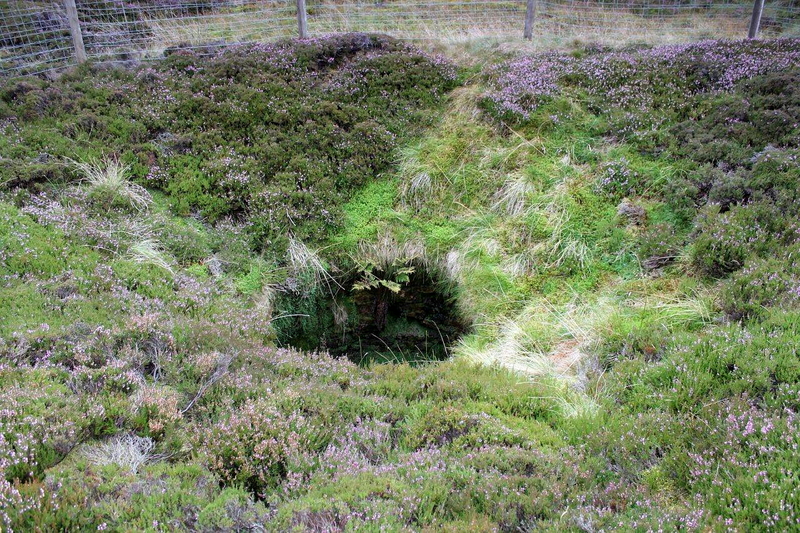 The really dangerous holes are usually fenced off to prevent livestock and humans toppling to their deaths so there’s nothing to worry about unless you go poking around where you’re advised not to go. The title made me smile! As usual, I learned a lot while admiring the photos. If I had been walking there, I would never have known what I was seeing beyond “old coal mine stuff.” I wish I could crawl through the screen into that pub, though. Hi Jeanne. 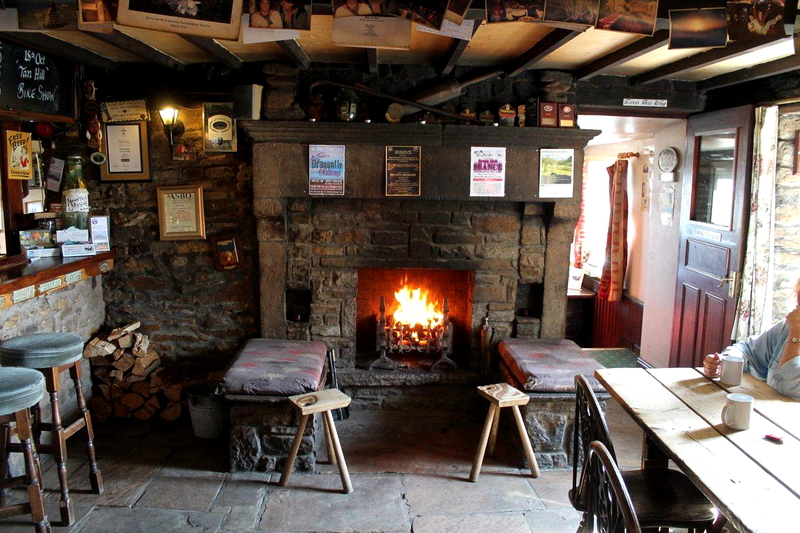 It’s one of the best pubs in Britain. The beer is first class, the food excellent, the company always interesting, and it hardly ever closes its doors. The weather can get a bit wild in winter, but with a fire like that it doesn’t matter. I’ve driven past the Inn, but didn’t stop. Can’t remember the circumstance, but it must have been something urgent that made me pass on by. Nice to see another goods wagon. Imagine if you could get one home: you could turn it into a coal-fired office. I have contemplated the idea of a goods wagon shed in the garden but it wouldn’t fit up the path between the houses without a lift from a crane. Yes, poor old Ted Moult. He was one of those people who became quite famous but no one knew quite why. The Tan Hill Everest advert is YouTube, if anyone is interested. Well that certainly broke the nervous referendum tension in this hoose for the first time today. I did – and I think I’m coining a phrase here – laugh out loud. Hi Scott. Glad to be of assistance. It’s rewarding to know I’ve spread a little sunshine on this day of unparalleled importance. 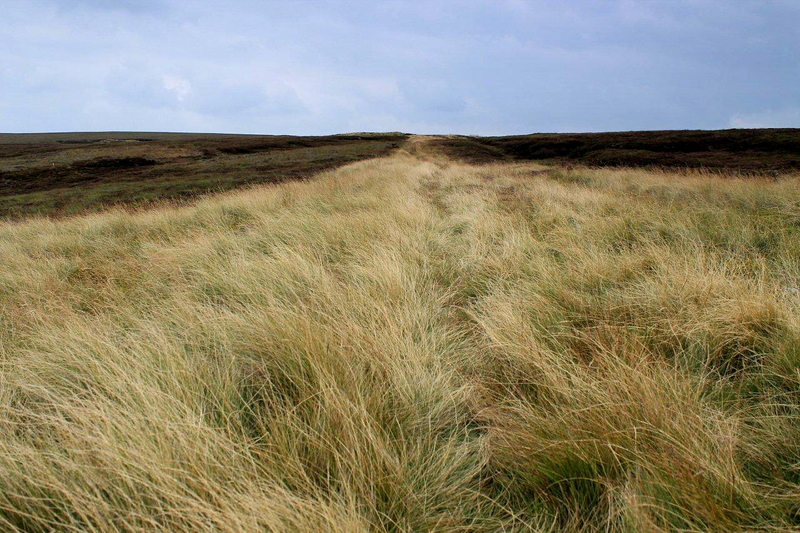 Glad you survived otherwise, the moor would be haunted by bags from Sainsbury with rattling lumps of coal. As if it wasn’t enough with declining feathers in the inn. Your found of coal made ​​me think of a bitterly cold October morning by a fishing river in Norway. It was my turn to coffee making. The branches and twigs I could gather was wet. I could have used your bag of weathered coal. A good plan is a plan including built in detours. That is a brilliant way to make an enjoyable hike. By the way, did you use firewood to get the coal to burn? Hej Hanna. Coffee made over a smoky fire on the side of a river in Norway sounds an ideal way to spend some time. 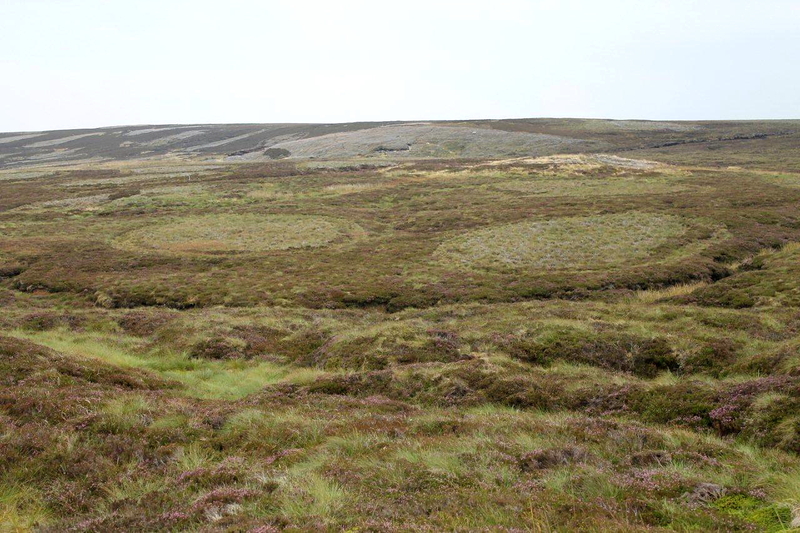 It certainly has of an appeal than a barren moor on the top of the Pennines. 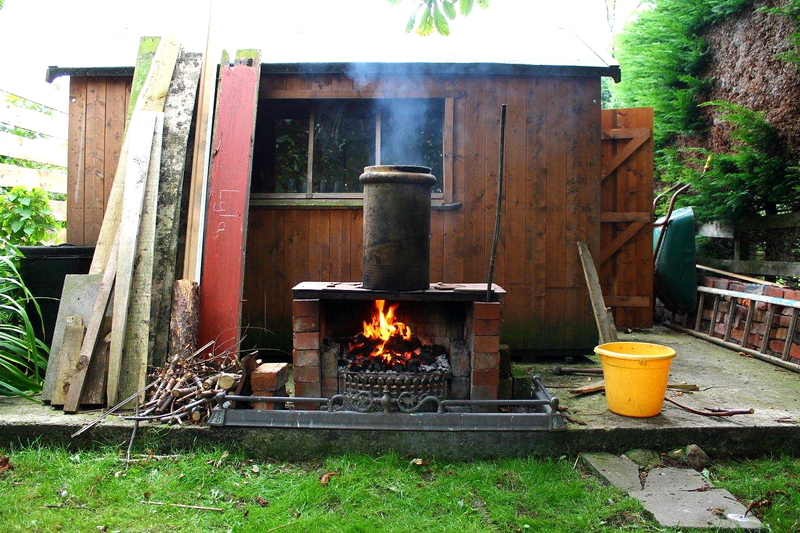 Yes, I used firewood to get the coal burning. Not wet twigs gathered from the forest, but some old planks I happened to have lying about in the garden. Superb interesting post. I love the first photo by the way – you’d never think it was connected with industry. Good on you for gathering the coal – I remember once we gathered some sea coal from a beach and took it home to burn it – I think it burned okay (I was very young at the time). 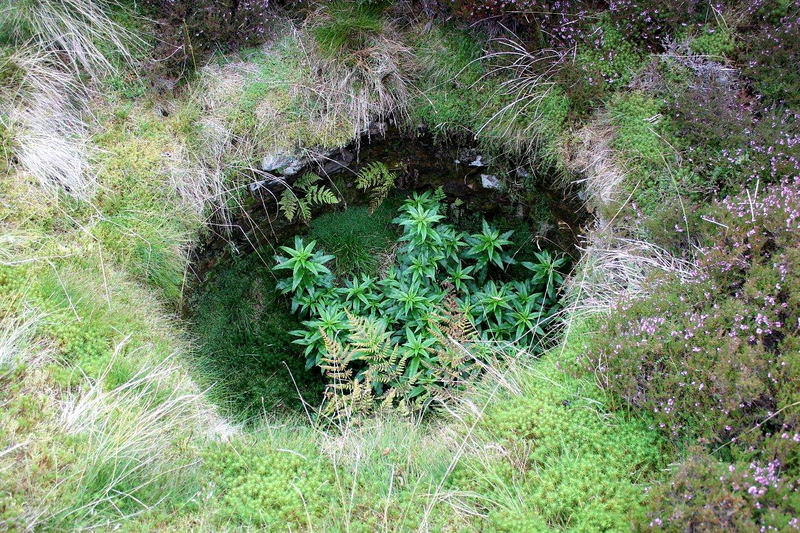 I think a lot more old mineshafts will be collapsing if we start with fracking! Don’t get me going about fracking. The government has just changed the law so that energy companies can drill under your land, even if you refuse permission. So much for the democracy our country has been spreading around the world for the past few decades. But democracy goes out of the window when money and trade are involved. I think we knew that. We used to have a neighbour in Cumbria who bought bags of sea coal from a chap in Northumberland then sold them on for £2 a time. It was good stuff for banking up the fire last thing at night because it was very fine – like gravel – and kept the fire smouldering away well into the next morning. I might look into that. I rather fancy a coastal walk. I personally don’t think what we have here can be called democracy. If you don’t like something, you can’t really do anything about it! You get one vote every five years. Meanwhile, measures such as the bedroom tax, health service sell-offs and the fracking law – none of which appeared in any manifesto – are steamrollered in. And we are supposed to be a shining example of democracy throughout the world? Bloody hell, Carol. It isn’t even dinner time and you’ve got me going already. HI Alen, interesting post. Can’t say that I have noticed the workings around Tan Hill Inn. I once camped behind the Inn one Saturday night before leaving my car there for three days to do a circular walk. They had a lock in there I think because, I hear shouts and laughter going on until 2 in the morning. I didn’t get much sleep that night. Should have made my way back to the pub and joined in! Hi Mark. The pub is notorious for its late-night drinking, which is great if you join in but not so good if you want to be up early. Thankfully, I’ve never needed to be up early after a night there. Having said that, the previous time Anne and I had a night there and slept in our vehicle was during the Falkland’s War, so I don’t think that classes us as regulars. Hi Wessyman. Thank you very much for that.